Dan Flanigan of Medina, Minn., bested a field of 51 players to win The BIG One last month at Laurel Park, taking home first-place money of $35,200 on top of his $5,850 bankroll. He also earned spots in the $2.8 million (estimated) Daily Racing Form/NTRA National Handicapping Championship (NHC) presented by Racetrack Television Network and Treasure Island Las Vegas, and the Breeders’ Cup Betting Challenge (BCBC). The 45-year-old equity trader will be making his sixth consecutive appearance at the world’s richest and most prestigious handicapping contest when he competes at NHC 18, set for Jan. 27-29, 2017, at Treasure Island. 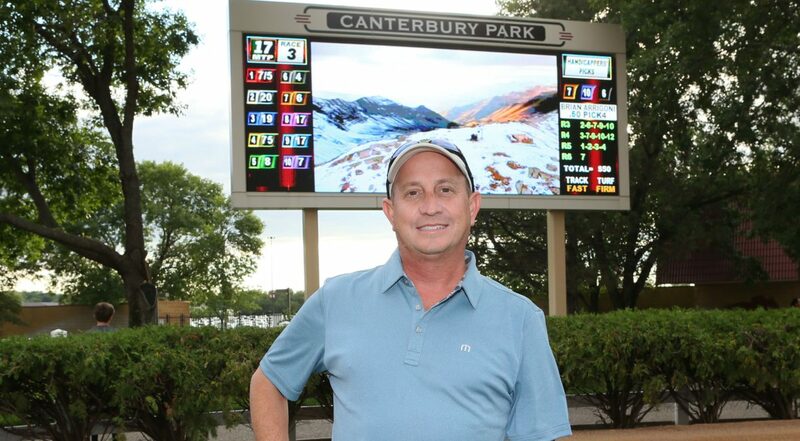 Flanigan attends the races at Canterbury Park nearly every week with his wife, Jenny, and three kids, Shane, Ronan and Delaney. He owns a small string of horses that campaign in Minnesota and Oklahoma with trainer Vic Hanson. What was your strategy going into The BIG One? “I used to walk into these things just trying to pick horses as opposed to really taking a strategy. Now I go in thinking about what dollar amount I need to reach to win and what big plays I like that will help me get there, especially late in the second day. I’ve learned about saving your bullets and waiting to the end. What did you like about the horses you used in that race? “Ten Penny Princess was the one I really liked and she was 8-1 on the morning line. But she had some good Ragozin numbers and I kind of figured I wouldn’t get that. Rosedale Arch was also an 8-1 morning line and I remembered from her last race that she had come out of the 10-hole and faded at the end. I was thinking that if the horse came out of a better post and could get to the front she could either win or hold on for second. The win bet paid $1,640 and your exacta was worth $4,200, so you blew past your $5,000 target. “I still had one race to go. With eight Breeders’ Cup Betting Challenge seats, though, I kind of figured the players behind me wouldn’t want to risk those to try and catch me. They would be happy where they were. I was up about $2,500 and decided I just wasn’t betting anymore. The guy behind me did hit a $60 exacta in the last race but I still won by about $600. It’s interesting how you describe working backwards from your target. Can you tell us more about how your discipline and strategy have grown with more contest experience? “What I’ve learned just from talking to winners and sitting with winners and hanging with winners is that I was really missing that organization and planning. I never used to have a number in my head but when you get to know the really good players, they always have a number in their head. “It was either Paul or Bill Shurman that first told me about working backwards because you’ve got to know what’s out there that can get you where you need to be. If you really like a horse toward the end of the contest, that’s a great spot to be in, as long as you can just get there with enough money. One year at the NHC it turned out I had the most winners of anyone in the contest, but it didn’t do me any good because they were all 5-2 and 3-1 shots. When did you first start competing in handicapping contests and how often do you play in NHC qualifiers? What tools do you use for your handicapping? Does your experience as an owner inform your handicapping? “That perspective helps me a ton. When I look at horses that maybe don’t look great on paper but they’re fresh or taking a big drop in class, I know they can win because I’ve been beaten by horses like that. How did you first get into racing as a fan and then as an owner? “I moved to Minnesota in 1998 and I got into a Sovereign Stable syndicate with some guys at work. We had some success and it was a blast. But our horses were running out east and we were going to Canterbury Park all the time so I decided I’d be better off owning horses here where I could watch them run in person. We claimed a Minnesota-bred, Cousin Sue, from Churchill Downs and that’s how we started. We’ve had 145 starts here in the last 10 years.